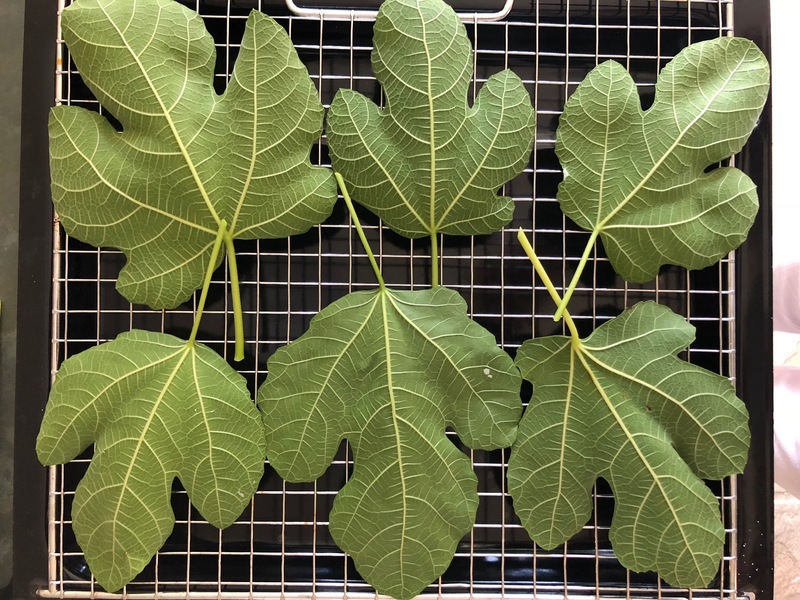 I have always loved the heady scent of fig leaves and although our fig tree in the garden does eventually produce ripe fruit, it isn’t until about late September. 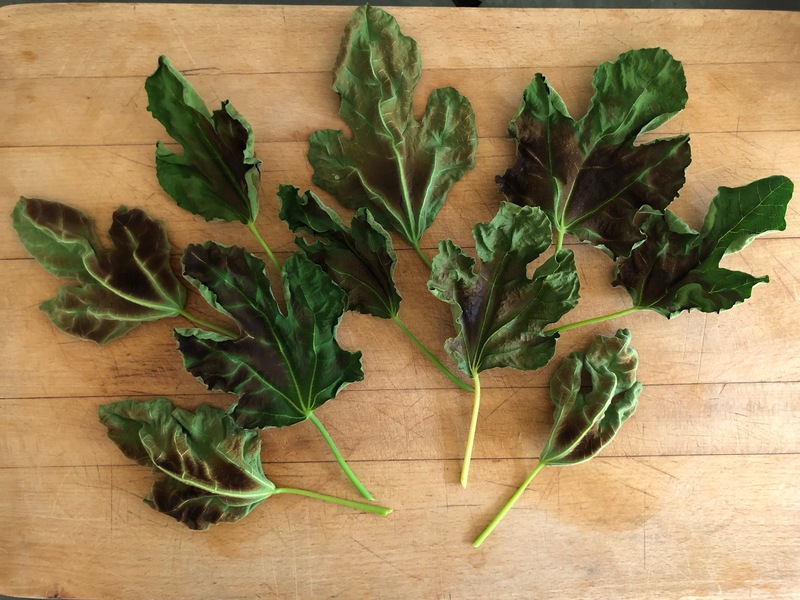 In the meantime, I make the most of its leaves (of which it has many to spare) and this is one of my favourite ways to cook with them. Credit goes to my friend Claire Ptak whose book The Violet Bakery, contains a recipe for toasted fig leaf ice-cream. This simple extra step of toasting takes the flavour into a new dimension. I must credit Claire entirely for this and add that my only small augmentation to the recipe was to swirl a puree of lightly cooked, sieved blackcurrants into the ice-cream at the end. I found that not only does it make a scoop look even more beautiful, but the slightly tart, rich berry flavour works beautifully with the toasty fragrance of the fig leaves. Preheat your grill to the highest setting. Lay the leaves out flat on a baking tray (do this in stages if they won’t all fit at once) and place them on the highest rack under your grill, leaving the door slightly ajar. Watch them carefully as they start to shrivel and colour. Turn them once or move them around if necessary if some parts are browning faster than others. You just want them to brown, not singe. 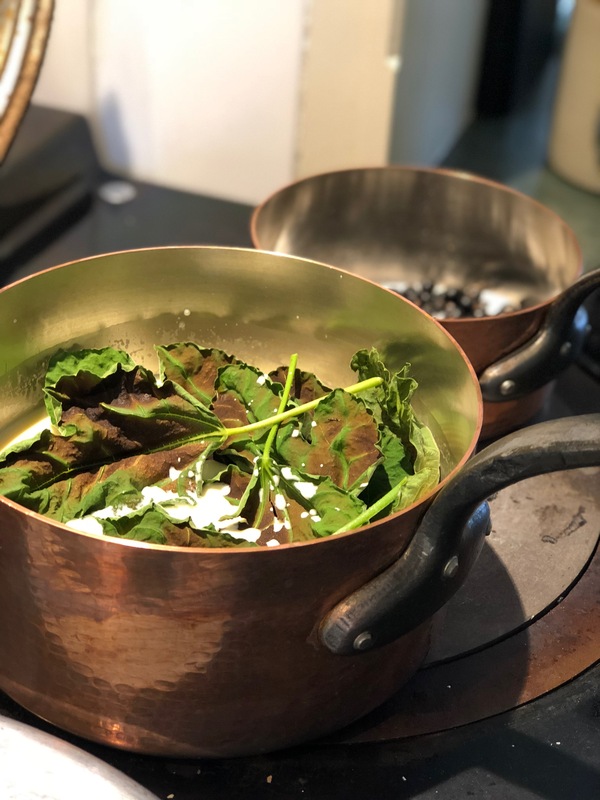 Put the toasted fig leaves in a large saucepan with the milk, cream and sugar and heat until the milk starts to bubble. Take off the heat. Whisk the egg yolks in a large bowl and slowly pour the heated cream in a steady stream onto the yolks, whisking all the time. Return the mixture to saucepan and cook very gently, always stirring, until the mixture thickens slightly and starts to coat the back of a spoon. Pour into a shallow container to cool and then churn in an icecream machine. Meanwhile, to make the blackcurrant ripple: heat the currants and sugar gently in a small saucepan until the sugar dissolves and the currants start to burst and seep out their juices. Push the mixture through a sieve and chill. When the ice-cream is churned to a soft consistency, spoon it into a container and stir (briefly) the blackcurrant puree in streaks through it, then freeze.